In the graph of portfolio performance dividends are included, but in “Return (in USD)” of current holdings dividends are not included. I have not commented that much about LG Chem, although it has moved up to be my largest holding. The investment traces back to my investment theme 2 years ago when I started the blog. The six months before the blog was launched I had spent a lot of time to research the whole value chain of Electric Vehicles (EVs). I ended up concluding that it will be very hard to forecast a winner among the many car makers. As a side note I did and do still have a belief that Chinese automakers will step up and take a large part of the global vehicle sales pie. I looked at three segments of the value chain, mining companies, battery producers and semiconductor companies. Semiconductor companies I dismissed, since at the time I saw it as more linked to smart/self-driving vehicles. It then came down to mining or battery companies. When I looked into the supply situation of Lithium, from what I could gather there was actually plenty of supply, the bottleneck was rather Cobalt, but here there were no decent investment options. Batteries also had the tailwind of Energy storage systems, that could potential ramp up demand substantially on the back of more Solar energy usage. So batteries became what I focused on. 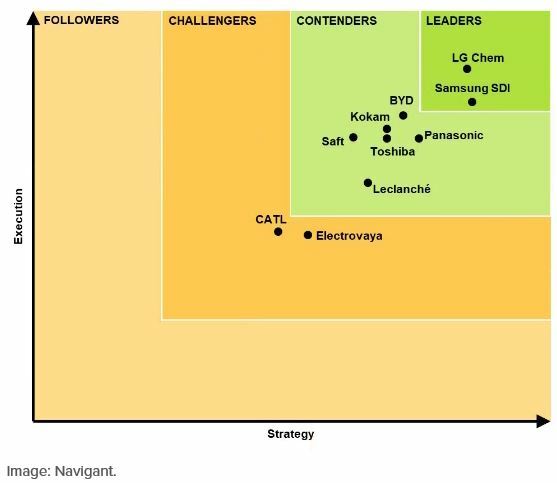 LG chem was and continues to be a world leader in battery production, with the most advanced batteries in terms of performance vs price. The problem with LG Chem, was like most of the investment cases around the EV value chain, it was not a pure play. Most of LG Chem’s revenue comes from chemicals sales which is totally unrelated to EVs. I tried to analyze the chemicals business best I could, but it is a complex field. I understood that I did not buy into something at peak valuations, but rather chemicals where trading at somewhat depressed levels, my analysis did not really go deeper than that. I reasoned that expanding battery production, to meet the enormous future demand, would require a sizable company with muscles to expand. So without knowing that much about the chemicals business, I saw it as a good backbone to build the battery production capacity on. And that is more or less what LG Chem has been doing. Capex and R&D expense is planned to increase substantially in the coming years, on the back of strong cash-flows in the last quarters. Looking at the future, worries lies in if there will be any substantial margins left for the battery producers. As Chinese new giants like CATL steps up to the plate, it would not be the first time a thriving profitable industry, becomes like the solar industry where huge volumes are produced, but no money is made. What keeps me somewhat comforted is that there are safety and quality aspects to these batteries produced, which means that a battery product is not just only about cheapest possible price per kWh of battery power. There are also more long-term quality and safety aspects to a battery product. Even after the strong share performance, the company is trading at an undemanding trailing P/E of 15 and a estimated forward P/E of 13, which is in the middle of the range of it’s long-term P/E band. I would argue there is still room on the upside, even short-term. Since we are closing in on the S-curve area of EV adoption, where LG Chem is bound to see strong Revenue growth. A few years ago, it was estimated we would see substantial EV sales come through around 2020. But it’s more likely that most cars will be Plug-In hybrids around 2020 and pure EVs really taking of on a massive scale, is still probably a few more years into the future. But say 2025, I’m certain 75%+ of all new cars sold will be either a hybrid or a full EV car. If LG Chem manage to keep in the forefront of battery production, it is a company I’m very willing to hold for the coming 10 years. Dairy Farm being a conglomerate within a even larger conglomerate. One could argue that instead of buying into Dairy Farm I should take a position in the whole Jardine Group. But I do like being exposed to food in the Asian region. Food is of course important to everyone around the globe, but Asians are in my view even bigger foodies than westerns. As the region grows richer, which its more or less bound to do, if Dairy Farm plays its cards right, it should be able to long term leverage that trend. Of course it is a highly competitive market, but with the Jardine Group behind it, Dairy Farm has all the advantages you could have for this region. I see this as a very long term holding, which I would only re-evaluate if I saw that something major had changed in the direction of the company. 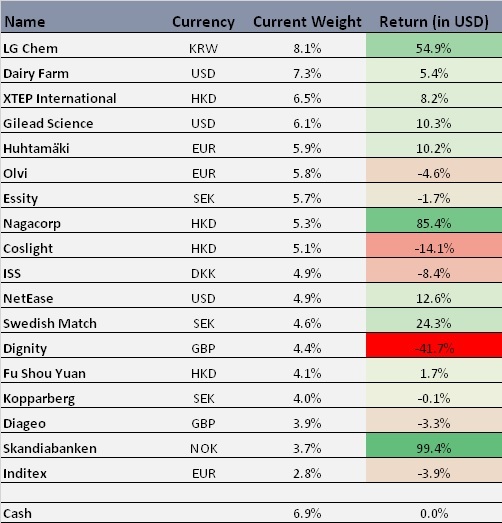 The more I learn about Hong Kong listed companies and market participants, I realize mis-pricing are more common, or at least market participants have another time horizon and sentiment shifts in their investments. When the sentiment finally changes, it’s a bit like the famous ketchup bottle, positive momentum builds quick and reprices the stock to a new level in a very short time. For a stock picker that is of course a good thing, if you can get in before the sentiment changes. But you also need to be very sure about what you are investing in, since your patience and thesis will be tested. XTEP has had a a similar story of under-performance and then a catch-up. The clear winner though has been the largest company Anta, which since I invested has continued to outperform its peers. When I invested about a year ago, XTEP was the ugly duckling, trading at a much lower P/E than its peers. One of the reasons as I have understood more clearly is that XTEP competitors are aiming more for the branded high priced segment, competing with Nike etc. XTEP has had it’s niche more towards the cheap/affordable running shoes. Much of the growth trend (so far) in health and sport awareness among Chinese has been in the more affluent population which obviously will go either for western brands or top Chinese brands. I tried with this investment think second level, that since healthy living and exercising already is a strong trend in China among rich people, that maybe it would also affect the middle class population to consume more sports shoes. The jury is probably still out if XTEP will succeed in this. Looking to the future, I think the sports apparel segment is a good segment to be invested in. The tailwind from Chinese consumers on these type of products should continue. If XTEP is a good enough company in terms of execution and brand building, that I’m less sure of. Basically because I’m not in touch with its customer base, or consume their products myself. So the case for me to generate alpha in terms of stock picking, is lower here, where I only go by what I can see in the data. For these reasons I will probably never be fully comfortable with this as a very long term investment and my strategy lately has been to ride this positive momentum that finally arrived and look for a good exit level in this holding. I was reflecting on that I spent a lot of my research time on looking at Health Care/Pharma companies of different kinds, everything from more niche small cap companies producing probiotics or vaccines, too large companies like Teva. It’s a bit ironic then that currently I only hold one single Pharma company, and that is a company I spent less time researching myself and more followed the results of others that I respect for their knowledge. WertArt’s excellent analysis helped my jump the boat and invest. Since I invested Gilead has made some larger acquisitions, again I’m not competent enough to understand if this was positive or not. I can only see that the Gilead management has had a fairly good track-record in its larger purchases. The question to ask myself really is, since I seem to have no to a weak edge in being able to understand and analyse big Pharma companies, should I even invest in them? I’m not a benchmark agnostic investor and the Health care segment has 12% weight in MSCI World. With such a large weight in the benchmark I would rather say that I want to hold at least one Health Care company. For now I’m happy holding Gilead as a good pick in the segment, but I will do my best to find smaller companies in this sector, which are easier to grasp. In a very fragmented market Huhtamäki has managed to take a strong position in the food packing market by doing a large number of smaller acquisitions. Food packing I believe has a long-term strong tailwind. In terms of risk I see a trend where large companies decided to be more eco-friendly. Seeing the documentary “A Plastic Ocean” makes you very sad of. We treat our environment in a horrible way in terms of plastic packaging. Maybe in parts of the world, there will be trend towards more paper/wood based packaging products. Huhtamäki today does both, so even this I don’t think is a major risk long-term, although short term it could create some losses if the plastic production facilities would become underutilized. In the case of Huhtamäki a full analysis of the company is long overdue, it’s something I kept pushing forward as I feel I understand the company fairly well. The truth probably is somewhere in between since I have not sat down and looked at detailed figures of the company, reading many of the previous annual reports etc, as I usually do when I fully analyze a company. Instead of doing a half-hearted attempt here now, I will instead try to deliver a full analysis of the company in the next few weeks. As I have mentioned in several posts, I have been circling the Pharma sector for quite some time now. Since it is, at best, a murky area to try to estimate the value of a big companies research pipeline, I have struggled to come to an investment decision. It’s easier with companies where current cash-flow motives more of the value. I tend to end up a bit too much on Seeking alpha, trying to find people who do understand the intricate details of this industry and especially the pipeline. Someone that I do trust though on the topic is Martin Shkreli, who freely shares on his thoughts in his Youtube streams. He is a fan of Gilead lately (when the valuation has come down). That gave me some comfort to keep looking at the stock. After seeing this (WertArt Capital on Gilead) very in-depth review of Gilead, I realized I might be a bit late to the party. But nevertheless, I want exposure to the sector which I feel have come down valuation wise and is defensive. Giliead is the best I have been able to come up with after a long search. I feel confident enough to take a position at what I believe is still a decent entry point, with some confirmation that the down-trend is broken. The case is simple, if this company is not a fraud, it is undervalued. All other Chinese shoe companies have continued to perform fairly well and outperformed XTEP. This might be the ugly duckling, but I don’t believe it is THAT ugly. We will also get a very quick answer on my bet, since the earning report is released tomorrow, I’m hoping for a +10% pop upwards in the stock-price. The countries outside of China keep disappointing me in how much they dare to commit to electric buses, it’s already proven to work fine in China. This is where BYD is very strong and have a top product. On top of that I still don’t see BYD releasing a car anything near to Tesla Model 3 or Chevy Bolt, so my thesis from over a year ago, that I’m unsure of BYD’s success in the car market, stays the same. I haven’t given up on BYD, but I could see this one visit the high 30’s again and choose to reduce my position. This was my Belt and Road play, perhaps somewhat sloppily implemented. I decided to not invest in the theme before I understand it much better than I do right now. It has a holding I don’t have a strong view on and selling it reduces my China exposure, so out it goes. ..will be about Teva. I have been very occupied lately and I still need some time to dive into the details. So stay tuned for Part 2 and let’s see if it becomes a new investment or not.